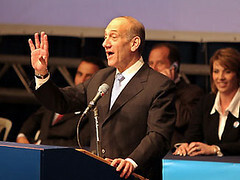 Israeli Prime Minister-elect Ehud Olmert acknowledges cheers as he makes his victory speech March 29 near Jerusalem. JERUSALEM (JTA) - A major shift in Israeli politics was cemented this week, with Ehud Olmert's centrist Kadima Party poised to form the next government. The party didn't fare as well as expected in Tuesday's elections, but Olmert is likely to be able to form a solid majority in the Knesset, allowing him to move ahead with his stated intention of further withdrawal from the West Bank. The elections, the first since Ariel Sharon's abrupt departure from the Israeli political scene, were seen in large part as a referendum on the withdrawal proposal. As is often the case in Israeli politics, there were surprises. The biggest were Kadima's weaker-than-expected showing; the emergence of the hard-line Yisrael Beiteinu as the third-largest party, ahead of Likud; and the strong showing of a newcomer, the Pensioners party, which hadn't been expected to win any seats. Exit polls Tuesday night gave the centrist Kadima 29 to 31 seats, the left-tending Labor 20 to 22 seats and the right-wing Likud Party 11 to 12 seats. Yisrael Beiteinu, which drew significant Russian support, garnered 12 to14 seats, according to the exit polls. Shas and United Torah Judaism, two fervently Orthodox parties, won 10 to 11 seats and five to six seats, respectively. The Pensioners, led by 79-year-old former Mossad agent Rafi Eitan, appealed to senior citizens with its focus on benefits for the elderly and won six to eight seats. Arab parties won seven to eight seats. Voter turnout was 63 percent, by far the lowest in Israel's history. Most significantly, the center-left parties - Kadima, Labor, the Pensioners, Meretz and the Arab lists - together have around 70 seats in the 120-member Knesset. That means that the right wing and religious bloc - Likud, Yisrael Beiteinu, National Union-National Religious Party, Shas and United Torah Judaism - have only 50 seats between them, 10 less than they needed to stop Olmert from forming the next government. So how did Kadima win? For one, Likud leader Benjamin Netanyahu's scare tactics - raising the specter of an Iran-supported, fundamentalist, Hamas-led Palestinian entity on Israel's doorstep - backfired. Those he frightened didn't necessarily see him as the leader best-equipped to deal with the threat, and many of them voted for parties further right, such as Yisrael Beiteinu. Under the leadership of Avigdor Lieberman, who immigrated in 1978 from Moldova, Yisrael Beiteinu is a hawkish party with an immigrant-rights focus. The party backs Olmert's proposed West Bank withdrawal in order to separate Israelis and Palestinians, but also proposes redrawing Israel's border to exclude large numbers of Israeli Arabs who live close to Palestinian areas. Many other Israeli voters moved to the center, backing Olmert's plan for unilateral disengagement from the Palestinians as the most rational way of dealing with the threat from a Hamas-led Palestinian Authority. Likud lost much of its traditional Sephardi working-class base to Labor, with its strong socioeconomic message, but Labor lost even more of its middle-class Ashkenazi voters to Kadima and the Pensioners. If the exit poll numbers hold up, Olmert will be prime minister with wide coalition options. He has made support for his plan to establish new borders between Israel and the Palestinians a condition for joining his coalition. That rules out the hawkish National Union-National Religious Party and the Likud, and makes Labor the most natural coalition partner. Around the Kadima-Labor core, Olmert will be able to choose one or more additional coalition partners from the Pensioners, Meretz, Yisrael Beiteinu, Shas and United Torah Judaism. Ideally, he would like to achieve a balance between left and right and between secular and religious parties. That would entail a broad-based coalition of 70-90 Knesset seats. Whatever form the coalition eventually takes, Olmert will have a clear majority in the Knesset for his plan for separation from the Palestinians, which is likely to become the centerpiece of his new administration. Because Olmert made his intentions crystal-clear before the elections, right-wing opponents of the plan won’t be able to demand a referendum on the grounds that he misled the nation, as they did with Sharon’s pullout from Gaza last year. To a large extent, the election itself was a referendum on the withdrawal plan. It calls for a large-scale Israeli withdrawal from the West Bank and the establishment of permanent borders with the Palestinians within four years, by negotiation if possible and unilaterally if not. The plan is certain to dominate the political agenda in the new Knesset's term. The second major item in the government guidelines will be the administration’s socioeconomic agenda. As the price for bringing Labor into the government, Labor leader Amir Peretz will make a number of key socioeconomic demands, including raising the minimum wage from $730 to $1,000 a month, providing pensions for all and increasing the basket of subsidized medicines. The Pensioners will back him up, and Olmert will be forced to incorporate at least part of these demands in the government guidelines. Both agendas, the political and the socioeconomic, are extremely ambitious. But how realistic are they? To set new borders unilaterally, Olmert will need international, especially American, backing. It's by no means certain that the Bush administration will see eye-to-eye with him on where the new lines should be drawn. The key American document on the territorial issue is the Bush letter of April 2004. It refers to "already existing major Israeli population centers" being taken into account in setting permanent borders, but doesn’t specifically mention any of the large settlement blocs - Ariel, Etzion and parts of Jerusalem - that Olmert wants to keep. Moreover, the American position is that permanent borders should be the product of negotiations between Israel and the Palestinians, and it’s difficult to see Washington recognizing borders that Israel sets unilaterally. Olmert argues that with Hamas in power on the Palestinian side, Washington is likely to be more receptive to Israeli ideas on the border issue. To implement a Peretz-style socioeconomic package, Olmert will have to approve increased government spending. The trick will be to do that without impeding the impressive economic growth of the past few years - which was achieved, in large part, through fiscal austerity. Much will depend on Olmert's diplomatic initiative on the Palestinian track. If it leads to a prolonged cease-fire, that will help Israel’s growth prospects - while, possibly, postponing conflict until a future time. It also will make it easier for the government to cut the defense budget and release funds for social spending. The bottom line: Though Kadima did worse than expected, Olmert will be able to form a stable coalition and will not have to shelve any of his major policy goals. But his personal prestige has been compromised by the party's relatively poor showing, and his first order of business will be to establish his leadership credentials.